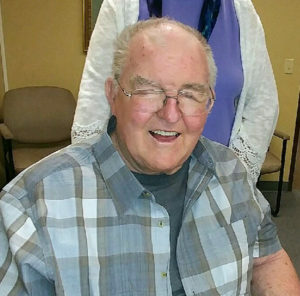 Thomas James Robinson, age 77, of Friendship, Wisconsin died Monday, November 5, 2018 at Villa Pines Living Center in Friendship, Wisconsin. Funeral services will be 1:00 p.m. on Saturday, November 10, 2018 at the Roseberry’s Funeral Home in Friendship, Wisconsin. Father James P. McNamee will officiate. Interment will be at the Holy Rosary Catholic Cemetery, Elroy, Wisconsin. Visitation will be at Roseberry’s Funeral Home from 4 to 8 p.m. on Friday and on Saturday from 11:00 a.m. until the time of service. Thomas was born March 15, 1941 in Mauston, Wisconsin to Arthur and Veronica Robinson. He graduated from Madonna Catholic School in Mauston, Wisconsin. He married Sharon Prouty on June 15, 1968 in Rolla, North Dakota. Thomas drove semi-truck and farmed most of his life. In 1991, he and Sharon purchased Inn of the Pines Motel. They owned and operated the Inn of the Pines for 25 years. Thomas enjoyed hunting, telling stories and jokes, and spending time with family and friends. Thomas was a member of NRA, Arkdale Lions club, Neillsville Snowmobile Club, and the Jack Pine Savages. Thomas was preceded in death by his parents: Arthur and Veronica Robinson; daughter, Michelle; and grandson, Keven. Further survived by nieces, nephews, other relatives, and friends. Roseberry’s Funeral Home is assisting the family. Visit www.roseberrys.com for online condolences and further information. To all of Tom and Sharon’s family and especially to Sharon, my sincere condolences at the passing of a good man! May your memories bring you comfort and peace and may you always remember he lives on in all of you and is proud of each of you! Tom will live on in his children, his wife, and friends. Tom was real good at telling jokes. He made many people laugh and smile. I raise a bottle of beer to you sir! Plus you still live on in my heart and mind. Sorry for your loss. Tom was a great guy and we always enjoyed talking with him about life experiences. So sorry for your loss. May the great memories you have help during this difficult time. We were so sorry to hear…our deepest sympathy to the family!! Sorry for loss, he will be missed by many. One of a kind! Sharon, so sorry for your loss! Hugs and prayers! RIP Tom! Sending my deepest sympathies to your family and friends of Tom. I have so many great memories at the Inn of the Pines. The music of the “Invaders” band, drinking, laughing and dancing with my husband Richard. Tom was a good man and will be missed. So sorry for your loss. Will always remember the smile and the kind generous treatment after hours at the Pines. Loved swapping trucker stories with him. So sorry to all of you for your loss. Tom was a great man. Extending our sympathies to you. Sharon,Jacci, Trevor and family, I am so sorry for your loss. TOM was a “gooder” man. Never a dull moment when taking care of him. I will miss him so much. His smile his jokes just everything about him. Sharon so sorry Tom passed away. He was a wonderful man always was a caring person. I will always love and miss him. Hoping you all will think of the good times. There were many. If you need anything let me know. Take care of yourself. And your family. Patty Schiefer.and family. Sorry to hear of Toms passing! He will be missed. Sharon, Jacci Tommy and Amy I am so sorry to hear of Tom’s passing. He was a great man to know. Love you all. Hugs. Sharon , Family sorry for your loss Tom will be missed as he was character ! So sorry to see this this…🙏for your families. I will miss his humor and genuine care of those around him. He will always be my favorite. So sorry to hear this. He was a good man and always made me laugh. He will be missed. Sharon and family So very sorry to hear of Toms passing. He was one of a kind. We have a lot of memories of all of you. May God comfort you in this time of sorrow. Sending hugs and prayers for all of you. Sharon and Family. We are so sorry for your loss. Always enjoyed being around Tom. He will be missed by many. Thoughts and prayers during this difficult time. So sorry for your loss. May God your family,friends and memories help to ease your pain. So sorry for your loss. Sharon, be sure to keep and share the good memories. I know you and Tom made many of them. So sorry to hear about Tom. God Bless…. So sorry for your loss. Tom was a great guy. Always kind and fun. He was so good to us when we made our frequent sad trips to Friendship. Take care Sharon. Rest in Peace Tom. Sharon and Family – My Sympathy on the loss of your loved one. Tom was always a joy to be around. Prayers and thoughts are with you during this difficult time. So sorry for your loss. May God bless you Sharon and family. So many great memories of The Inn of the Pines. RIP Tom. So sorry for your loss. Tom was a great guy. I have so many good memories from Jack pine bowl!!! RIP Tom.